In checking out what was happening in the "migraine world," I came across a tweet by Dr. Todd Schwedt of Mayo Clinic, Arizona, in which he mentioned his upcoming lecture to physicians at the University of Washington on migraineurs and the hypersensitive brain. Those last two words leaped from the page, as they were ones that I could relate to all too well. I have often wondered if my brain was actually hypersensitive, or if it was just my perception. For years, I have sworn that I could hear things through walls that no one else could hear and could smell what someone was cooking a block away. I have also had my brother come over in the middle of the night to put duct tape over every conceivable light in my home, as they all seemed to bore into my skull with the efficiency of a scalpel. I reached out to Dr. Schwedt who was happy to share his information with the readers of HealthCentral. He indicated that migraineurs "process and perceive individual modes of sensory stimuli differently than people without migraine." He also indicated that doctors and researchers know this not only because of patients' anecdotes, but also "because the hypersensitivity can be measured in the lab using physiologic tests, and because we can actually see the hyper-reactivity of sensory cortex with functional imaging of the migraine brain." So, it's not just something that is "all in my head," but actually something that is taking place in my brain In fact, not only do these sensitivities actually exist in our brains as migraineurs, but they "may also result in further enhancement of hypersensitivities to other stimuli (e.g., exposure to light leads to greater hypersensitivity to touch of the skin) and may contribute to worsening headache intensity." Somatosensory refers to "reduced cutaneous pain threshold" and "cutaneous allodynia." Allodynia is when pain is caused by something that doesn't normally induce or cause pain. For example, some migraineurs experience scalp allodynia where the simple process of brushing their hair or having water from a shower fall on their head is painful. Dr. Schwedt notes that two-thirds of migraineurs experience cutaneous allodynia during a migraine attack. He also points that some migraineurs experience this allodynia even between migraine attacks and may be more sensitive to cold and to heat between attacks, in addition to pain. Visual Visual hypersensitivity to light is known as photophobia. According to Dr. Schwedt, 50-90% of migraineurs experience this. He points out that "light and visual patterns may cause generalized discomfort and increase the intensity of the headache pain." Of particular interest is his statement that "even after 72 hours of migraine freedom, migraineurs have significantly lower visual discomfort thresholds compared to non-migraine controls." Additionally, between attacks migraineurs "have increased sensitivity to white light (unfiltered), high-wavelength light (red), and low-wavelength light (blue). AuditoryThis is also known as phonophobia, and 52%-82% of migraineurs experience this during a migraine attack. Similar to studies of somatosensory and visual sensitivity, auditory sensitivity is reported by 75% of migraineurs between attacks. Olfactorsmophobia is the medical term for sensitivity to smell. Sensitivity to odors such as perfume, foods, chemicals, and cigarette smoke are seen in 25%-43% of migraineurs during a migraine attack. 35% of migraineurs have osmophobia between attacks, and about 50% of migraineurs have a scent-related migraine trigger. While these definitions and percentages were of significant interest to me because I experience all four of these, I was even more fascinated by the fact that there is concrete data supporting and proving these common migraine symptoms. It's not that I'm a hypersensitive drama queen but that my brain is truly hypersensitive. So what happens in the brain, according to these tests, when one has allodynia, photophobia, phonophobia, and osmophobia? In reviewing this information in Stedman's Online Medical Dictionary, one sees that this has to do with a specific area of the midbrain that plays a role in the regulation of pain. The temporal lobe has to do with auditory processing. "Quantitative testing shows that the interictal migraineur is more sensitive to sound compared to the non-migraine control and that the migraine patient is even more sensitive to sound during a migraine attack compared to the interictal period." Interictal refers to the period between attacks. "An interictal PET study of migraineurs with odor hypersensitivity showed that in response to odorants and compared to non-migraine controls, migraineurs had greater activation in the left temporal pole and less activation in frontal, temporo-parietal, posterior cingulate and locus ceruleus regions. Compared to migraineurs between attacks, those during an attack have greater activation in several olfactory, limbic, and pain matrix regions including regions in the amygdala, insula, temporal pole, superior temporal gyrus, cerebellum, and rostral pons." The olfactory region is that region of the brain that has to do with smell. 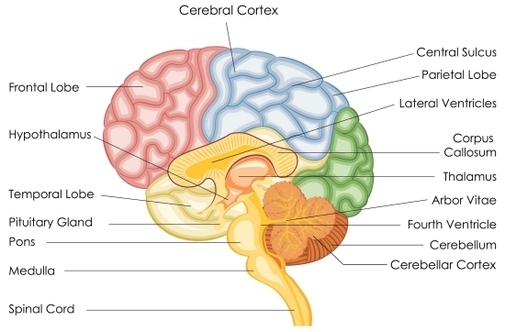 The limbic region has to do with that area of the brain that deals with emotion and the formation of memories. As migraineurs, most of us have hyper-excitable brains, which predispose us to hypersensitivities in the areas of pain, temperature, vision, sound, and odor. These hypersensitivities not only increase our experience of pain, but also our level of disability. This is not a matter of perception, but rather of true physiological and chemical changes that take place in the brain of the migraineur. Many migraineurs experience this hypersensitivity even when they are not in the midst of a migraine attack. This is because the brain of a migraineur is different than that of a non-migraineur. A part of the complex picture of migraines is the existence of a hyper-excitable brain. 1 Schwedt, Todd, MD, MSCI. "Multisensory Integration In Migraine. " Current Opinions in Neurology. 2013;26:248-253. 2 Interview: Dr. Todd Schwedt by Cyndi Jordan. September 5, 2014. Cyndi Jordan wrote about Migraine as a Patient Expert for HealthCentral. She is a member of the American Headache and Migraine Association and a Migraine advocate.